We provide driving lessons in Eastbourne and surrounding areas such as; Pevensey, Normans Bay, Polegate, Hailsham, Westham, East Dean, Seaford and more. The beauty when taking your driving lessons in Eastbourne is there are so many areas to practice in which can help develop all of your basic skills. From hilly country roads, to complex roundabouts and town driving - Eastbourne has it all and we have some of the best instructors in town to help you pass with class too! All of our instructors are regularly checked and have a minimum feedback score of 4.5 out of 5. Pupils who have recently passed with us in Eastbourne. 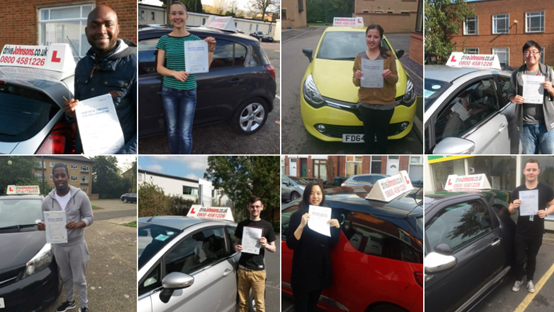 With various driving schools around the Eastbourne area, driveJohnson’s are the only driving school to offer a 91.1% first time pass rate, which is nearly double the national average! Offering a choice of intensive or semi-intensive lessons, depending on personal preferences and the rate you want to pass! Making driveJohnsons one of the most recommended Driving Schools in Eastbourne. Start your lessons with us and receive feedback and analysis at the end of each lesson which will be recorded within our famous driving manual and next generation online App which will help you learn smarter and faster! Don't miss out! There are currently only 39 offers left. Prices will return to normal once we have sold all of our remaining offers. How much do driving lessons cost in Eastbourne?